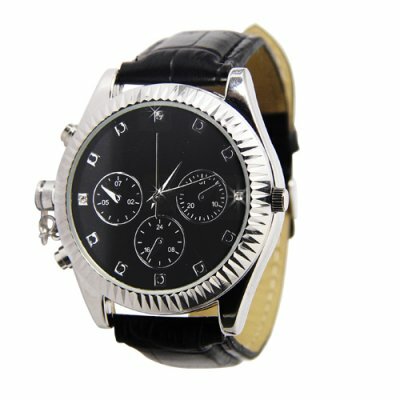 Successfully Added Secret Agent DVR Watch - Classic Design to your Shopping Cart. This is a high class surveillance DVR wrist watch, encased in polished stainless steel and held to your wrist with black leather straps. Record hours of video footage with this DVR wrist watch thanks to the 4GB internal flash memory, and view the artistic fruits of your labor, with a simple connection of the DVR watch to your laptop computer using the USB cable provided. This " watch" type micro video camcorder is different than other models because of its full leather strap and sophisticated design that makes it look like a modest priced designer watch. This model works just like a real watch, and comes with accurate gear driven time in seconds, minutes, hours and a twisting crown for time adjustment. This is the best way to record all your encounters, interviews, meetings and on the scene discussions without anyone knowing what you are doing. If you have ever had to spontaneously run into a meeting or had a sudden encounter with someone that just needed to be caught on camera, now you can instantly and secretively record that conversation for later review. This model offers you the chance to record both video and close range audio simultaneously. This classy looking DVR " watch" is the solution for both ladies and gentlemen! The camera is beautifully disguised, no one will ever suspect being spied upon at all. Place your order today for one watch for yourself, and then order in bulk for even greater wholesale savings to make this a high profit re-sale item for eBay, Amazon, or your own physical/internet store. The CVSD-I23 is proudly brought to you from the leaders in factory direct wholesale electronics, Chinavasion. How many hours of footage can I store on the 4 GB's of flash memory? The camera wrist watch can store up to 7 hours of video with audio. Do not use the SystemTime.txt file located on the CD rom. Instead, create a new text file named SystemTime.txt (case sensitive) and then follow these simple directions. Photos & Graphic By: T.L. Hello! I wonder how long it will take the product back to stock! Hope come back soon!! Yes this a great technology, a good spy watch for security, if your using it for security. Most definite work when catching good evidence to clear your case. I have order mines from your warehouse yet, but i do have one. I will be ordering from your warehouse soon very soon to try other products that you have for my business. pretty alright looking watch. the most important thing - captured video is quite good quality for the type of device. on 2010-08-31 00:34:05 I THINK THIS IS THE MOST ADVANCED TECHNOLOGY WATCH OF THIS KIND. I VIEW IT AS THE BEST IN THE WORLD OF TECHONOLOGY. Took about 10 minutes to figure out how to work. Instructions aren't really necessary for this device. All works well. Using windows media player for playback on windows vista. Overall a good product and fairly easy to use. Video quality isn't bad either.